GAINING entry to some of Northern Ireland’s perceived elite grammar schools is not as tough as you might expect, according to new figures obtained by The Detail. Data provided by the five education boards in response to a Freedom of Information request shows that the 65 grammar schools involved in this year’s transfer process received an average of only 19 more first preference applications than the number of first year places they have available for this September. 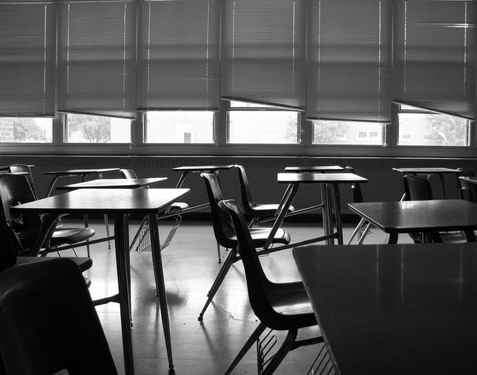 Meanwhile, an average of a third (32%) of Year 8 places for 2013 remain empty at non-grammars. In order to compete for grammar places, Primary 6 and 7 pupils must sit up to five grammar school entrance exams as the scores/grades obtained in these papers remain the top admissions criterion for all of these schools. Two separate independent testing systems are currently running in Northern Ireland after local politicians failed to agree on a replacement for the scrapped 11-plus test. As part of the annual transfer process, parents have to grapple with an education system split along religious lines and including different sectors, management types, integrated schools, all-ability schools, academically selective schools and others. The Detail’s analysis of the 2013 admissions data provided for 207 schools – 65 grammars and 142 non-grammars – shows a wide variation in competition for post-primary school places this year. See interactive map above. Over 20,000 children currently in Primary 7 are due to take up first year places at schools this September. The pupils received a letter from their local education board on May 25 informing them which school they will transfer to in September. Some grammars remain heavily over-subscribed, although three did not fill all of their places, while many non-grammar schools struggled and failed to fill their Year 8 places. As of this month, there are 24 unfilled Year 8 (first year) places in our grammar schools – compared to 5,281 empty Year 8 seats in the non-grammar sector. 99 schools – 62 grammars and 36 non-grammars – filled all of their Year 8 places and in some cases extended beyond their official admissions number. In the non-grammar sector, schools received on average 45 less first preference applications than the number of places they had available. At the time the data was sent to us by the boards, 64 children had not yet been placed in a school. He added that the large number of empty desks in our schools was “diverting badly needed resources away from the core business of providing pupils with a high quality educational experience”. What our figures do not provide is a breakdown of the grades or scores accepted by the 65 grammar schools. This information is not held at education board level and must be requested using Freedom of Information legislation from each individual school. Use the interactive map above to see how many applications there were to your local schools. The full data provided by the education boards is available in Excel format below this article. An ‘admissions number’ is set for each school which is the maximum number of pupils they are allowed to admit into Year 8. Transfer forms were filled in by parents and submitted to the education boards in February of this year. These forms list, in order of preference, the post-primary schools parents want their child to attend. They are encouraged to list at least three schools. Each form goes to the first preference school which applies its admissions criteria if over-subscribed. The form is then passed to schools further down the preference list if need be until a place is allocated. Sixty-five grammar schools selected their pupils this year using academic selection based on the scores/grades obtained in the entrance exams. Non-grammars use non-academic criteria if they are over-subscribed – for example, having a sibling at the school, being the eldest child, feeder primaries, parish, catchment area/nearest suitable school and a tie breaker (age, surname in random alphabetical order and random selection). We requested figures relating to applications and admission to every post-primary school from the five education boards. We received data on 207 schools. Once this data was received, we then calculated the empty Year 8 places for this September in each school by subtracting the total pupils admitted from the school’s admissions number which is the maximum number of pupils they are allowed to admit into Year 8. Pupils with a statement of special educational needs (SEN) are not counted within a school’s admissions and enrolment numbers at any stage – however, it is important to note that a high intake of SEN pupils could make a difference to the surplus capacity in some under-subscribed schools. The following schools are due to close at the end of August so are not included in our data – St Peter’s High in Derry, St Eugene’s High in Castlederg, Garvagh High and St Gemma’s High in Belfast. The data provided to us also does not include four schools from the Dickson Plan area in Craigavon/Portadown where there is delayed academic selection at age 14. These schools are Lurgan College, Portadown College, St Michael’s Grammar (Craigavon) and Craigavon Senior High. The Southern Education Board this week voted in favour of the reorganisation of post-primary education in the Portadown, Lurgan and Tandragee areas which could result in new bi-lateral schools with both selective and non-selective intakes. Under the proposal, grammars Portadown College and Lurgan College would become bi-lateral schools with both grammar and secondary streams and Clounagh, Killicomaine and Tandragee junior high schools would be merged into one junior college. A development proposal will be published in the autumn and, following a statutory period of consultation, the final decision on whether to grant approval will rest with the Minister of Education. The admission number at New-Bridge Integrated College in Banbridge was increased from 80 to 100 last month. Twenty children who had applied to New-Bridge and were advised that they were going to be placed at other schools have since been recalled to New-Bridge. We have added these 20 pupils into the New-Bridge data but are unable to amend the data for the schools they were due to attend as we do not have this breakdown. The Department of Education has confirmed there are currently over 78,000 unfilled places in total across Northern Ireland’s nursery, primary and post-primary schools. This figure excludes pupils with a statement of special educational needs and pupils admitted on appeal or by direction of the Exceptional Circumstances Body, as they are admitted over and above a school’s approved enrolment number. The most popular schools going by those with the most first preference applications were mainly grammars but also included one integrated and another non-grammar school. They were Methodist College in Belfast (289 first preference applications), Belfast Royal Academy (263), Thornhill College in Derry (256), Regent House in Newtownards (255), St Paul’s High, Bessbrook (250), St Columb’s College in Derry (244), Lagan College in Belfast (236), Banbridge Academy (229), St Patrick’s Academy Dungannon (228) and St Dominic’s High in Belfast (227). The Year 8 places at 62 of the 65 grammars filled all of their available places. At Strabane Academy 20 places remained (18% of the year 8 places) at the time the data was sent to us. This school was formed in 2011 by the merger of Strabane Grammar with Strabane High. Coleraine Inst has three places unfilled (2%) and one place remains free at St Columb’s College in Derry – despite this school receiving 288 applications for its 220 places. In Northern Ireland’s 20 integrated schools – an average of 17% of year 8 places are unfilled and half (10) of the 20 schools filled all of their places. In total, there are 314 unfilled Year 8 places in this sector. Only 12 pupils were admitted to a year 8 of 75 places at Crumlin Integrated High (84% unfilled) and 53% of the year 8 places at Blackwater Integrated College in Downpatrick remain empty. Blackwater and Crumlin have both been subject to formal intervention by the Department of Education. Among the schools which filled all of their places is Lagan College in Belfast – Northern Ireland’s first integrated school – which received a total of 290 applications (of all preference types) for its 200 year 8 places. The school with the most Year 8 places available is St Louise’s Comprehensive in Belfast with an admissions number of 356. It received 163 first preference applications and accepted the 203 total applications it received. This leaves 43% (153) of its year 8 places empty for September. Newtownhamilton High had the smallest number of places available – 37 – and filled all of these with first preference applicants. As already stated, the 65 grammar schools received an average of only 19 more first preference applications than the number of places they had available. Thirteen grammars had to go beyond pupils listing the school as their first preference to fill their places. However, some were heavily over-subscribed. St Dominic’s High on Belfast’s Falls Road received 86 more first preference applications than the 141 places it had available for September. Seven grammars in total received 50 or more first preference applications above their admissions number. As a result of the reduced competition for places, three of these schools have 100 or more unfilled places; 39 non-grammars failed to fill 50% or more of their Year 8 places and 11 schools filled a quarter or less of their places. However, some non-grammars were over-subscribed. For example, integrated schools Slemish College and Lagan College received 41 and 36 more first preference applications respectively than places available. The full data received from the education boards is available below this article. DO WE NEED MORE INTEGRATED SCHOOLS? An inevitable question resulting from our data analysis, will be whether the figures back the call for more integrated schools to be established in Northern Ireland. On average, 17% of the integrated schools’ first year places remain unfilled – compared to 32% of Year 8 places in the non-grammar sector as a whole. As with all sectors, some integrated schools received many more applications than places available – while others have a large number of unfilled places. Half (10) of the 20 integrated post-primary schools filled all of their places. In total, at the time the data was sent to us, there were 314 unfilled Year 8 places in this sector. We asked the Integrated Education Fund (IEF), which supports the growth of integrated school places, to comment on the education boards’ data. Tina Merron, IEF chief executive, said: “While is it apparent that some integrated schools, like many non-selective post-primary schools in Northern Ireland, have faced particular challenges from the current pressures on education, overall these figures show that integrated education is less affected by the demographic downturn than other sectors. “Figures from the Assembly Research Service show that the total number of pupils enrolled in integrated schools of both levels has steadily increased since 1998, even as the overall school population in Northern Ireland has fallen. “The issue of empty desks is one that must be addressed; 314 unfilled year 8 places in integrated colleges represent a small section of the thousands of surplus places across the education system. “We need the current area-based planning activity to produce results based on a holistic approach to education, meeting the needs of all pupils and the wishes of all families, which will mean taking segregation out of education. “Currently education reform is approached on the existing sectoral basis which is surely unwanted and outdated, failing to reflect the growing wish to see children of all backgrounds educated together. We also sent our key findings to the Department of Education and asked for a comment from Education Minister John O’Dowd. Mr O’Dowd said that he had previously outlined his concerns about the number of surplus places in our schools and that the large number of empty desks “was diverting badly needed resources away from the core business of providing pupils with a high quality educational experience”. He continued: “The fact is we have too many schools and the current pattern of provision is neither educationally viable nor financially sustainable going forward. “That is why I commissioned the development of area plans based on meeting the future educational needs of our young people. We need to build a network of strong, vibrant and sustainable schools going into the future." Regarding the time frame for progressing the area planning process the Minister said: “The consultations on the post-primary plans finished in October 2012 and the revised area plans for post-primary provision, together with reports on the consultation responses, were released by the education and library boards on February 26 2013. The Minister added that area planning is an ongoing process which will be reviewed and revised as more up to date data becomes available and planned changes are put in place. A steering group has been established to assist the department. Its work programme aims to fill the gaps in the current area plans, to embed a single approach to area planning and to identify priority areas for action in the short to medium term. Any significant change to a school requires the publication of a statutory Development Proposal (DP). To read more on the area planning process, click here. He said: “In a time of falling rolls there is inevitable pressure on the intakes of schools. “Equally inevitably, some schools are more popular than others, so some schools are more negatively affected by falling rolls than others. “The data analysed by The Detail highlights two trends. First, the only sectoral advantage in the competition for a declining number of pupils lies with the grammar schools, where there are fewer unfilled places than in other sectors. “Clearly many parents believe that their children will have a greater chance of academic success in a grammar school, hence their popularity. “Even so, there are some grammar schools that are clearly more popular than others, so just being a grammar school is no guarantee of popularity. “Second, the next most important factor lies in the local reputation of individual schools. Professor Gallagher said that local reputation is likely to be affected by many different factors. He continued: “A deliberative poll carried out in Omagh some years ago suggested that parents primarily wanted a reasonable guarantee that their child would receive a good quality education.